Facebook is number one social networking site to get instant traffic within seconds. It is one of the easiest way to be in touch with your followers. Based of Facebook algorithm, according to which it arrange posts in users news feed, you can't get 100% organic reach. For example, if you've 12K+ page likes then obviously, none of your post will reach to all those 12K people. On an average, it will remain between 1500 to 2000 which is approximately 15-20%. Well this is my own study and it may be different in your case but it would be almost same. In my case, one of my computer related page has 12k+ likes and most of the people who have liked this page are from Indian and Pakistan. In these countries, people are free in their evening, night and also in short morning time. This is the time period where most of the people are active on Facebook. On the other hand, Saturday and Sunday are usually holidays and again, most of the people are active on Facebook in these days. So these are the best time to post on Facebook. Other than this, I recommend you to do experiment of your own. 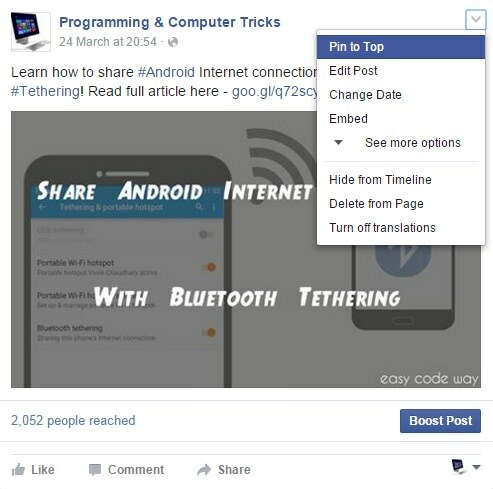 Try to share posts in different time periods and find perfect one for your page. This is another important thing which equally matters as other factors do. What I have observed is that, images performance is far better than any other post. They are given first priority in the news feed and that's why they reach more audience. Second position goes to status and third one to links. Link (individually) will reach very few people. You have to choose the right type of post. Most of people share their website webpages on Facebook but as we all know that links have very bad organic reach then how to improve it. The only way to do this is to add link in images. Simply add your links in post description and compare the difference. Also make sure to write very short description. This is because, long description will be truncated to few sentences and thus no one will find your links. So keep it short simply and to the point. Hashtags can do wonder for your page only if used in proper way. Before moving to the main part, tell me what do you think about hashtags. In simple words, hashtag is a word or a phrase preceded by a hash sign (#) which is used to highlight the topic. They were first introduced to provide real-time information like breaking news and treading topics but now they are used everywhere. For example, If I am writing a post of how to create Android apps then Android and app are the two most important keywords which are describing the title here. So I can hashtags them to highlight the topic. This will also help users to find more stories related to that topic. The other way you can boost your organic reach is by improving your page user engagement. User engagement means how people are interacting with your post. For example, a image with lots of likes, comments and shares tends to reach more audience when compared with other posts. User engagement can be improved simply by creating an awesome article which is useful for users. Post something different which is interesting and easy to share. Good examples are viral videos and photos. If you are a comedian, share best comedy videos. If you've a programming page, share all tips and tricks. People believe in facts and stats. If you're sharing a case study, add these things in it and then see how people will respond. Before posting anything, ask yourself that why people should share it or is it the thing which is easily shareable. If your answer is yes then go ahead and share it. Last but not least, reply back to all comments with regard. This is the best thing to improve user engagement. Also add values to your reply so as to take discussion a step ahead. Develop a bond between your fans. Give a reason to them so that they can come back to your page to see more interesting updates. In other words, turn them in daily visitors. Now this is something which is very very important. Whenever you google search anything, its may be possible that you'll click third or fourth search results instead of first one. This depends on the title and webpage description. Now if the description would be attractive, chances are, people will find more interest in that post. In the same way, if you're sharing a post on Facebook and it's really attractive then definitely it will reach more audience. Now lets take another example. If you find a video on Facebook then what will make you to watch it? Obviously, it is the description and video thumbnail which will attractive you. So what I want to say is that, create a post summary which will gain user attention. Ask questions so that they can comment and tag other friends to answer it. Add emotional values in description. For example, if you'll write something like this in video description - "Wow, Amazing! See how this man is walking on moving train", then here "Wow" and "Amazing" are the word which will attract and force users to watch full video. In the same way, create a short summary with a combination of hashtags, emotional words, questions, links (if necessary) and smileys also. Facebook provide pin feature using which you can tag any post at the top of your page. This feature is similar to pin feature for Facebook groups. Unfortunately, it is not available for Facebook profiles. 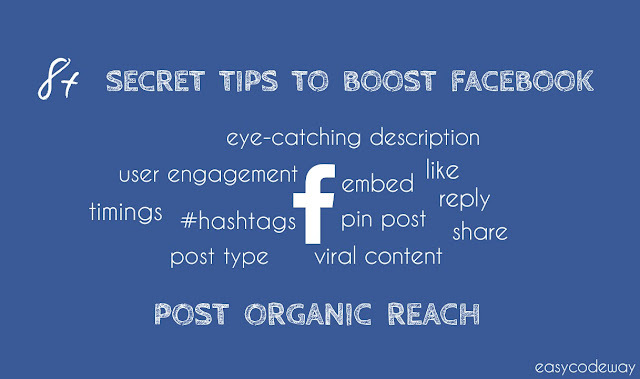 According to my studies, if you'll pin any post, it will boost up the organic reach by 25% least. Pin means something to mark as important. To use this feature, simply click on drop-down arrow icon available at the top-right corner of your post and hit "Pin to Top" button. Now reload the webpage and you'll find your post pinned at the top of your page with a badge sign. You can only pin 1 item at a time. One more important thing is that, you should regular replace the pinned post with new one so as to get maximum output from each post. 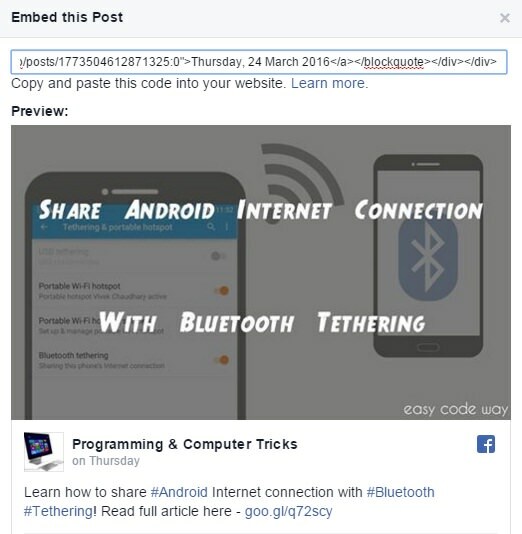 If you own a website or blog, you can embed Facebook posts in it. This is another way to boost organic traffic by which you can target more visitors coming to your website from other sources like from search engines especially Google. To use this feature, again click on drop-down arrow icon and hit "Embed" button. Sometimes, it may be under "More options". Now a pop up box will appear. From here, copy all code and paste it in your website. You can add it anywhere like in sidebar & header section, below or above title, in between article etc., If you're facing any problem while getting the code, then read this Facebook article to troubleshoot your problem. There is another manual way to get it. Embedding these Facebook post will slow down your webpage load time and that's why I don't use them but you can use this feature on videos, offer, discount and announcement posts for a short periods of time. If you have two eggs, out of which one is fresh and other is rotten then which one will you eat. Of course, fresh one. In the same way, Facebook also pick fresh content and display it first in users news feed. If you will look at the most active pages of Facebook including 9GAG, Filmygyan, Being Indian and few others, you'll find that they post regularly. On an average, they share 10+ images in a day. This makes their page alive and that's why there organic reach is more. You should also post regularly, at least 2-3 times in a day. To reduce your headache, add more content creators in your page. Otherwise, try to manage few hours in a week, create fresh content, schedule it for upcoming days, sit back to your chair and enjoy. Last but not least, share your post everywhere. For example, you can share it in your personal profile or on other pages. Apart from this, groups are the best way to share any category content. Simply collect all keywords related to your niche and find 20 around groups with 20K+ members. After joining them, share your post in each group and enjoy. Also encourage your friends or fans to share your content. You can tag them as well but it's not a good idea. As already mentioned, you should focus on those articles which are easily shareable. Now If you've any questions, fell free to ask me in below comment box. Did I had missed something?